The Muppets. What children of the 80’s didn’t love them? Sesame Street, The Muppet Show, and of course the theatrical films. Even when they weren’t all that great, they weren’t completely lamented. Except for maybe the time they tried to remake The Wizard of Oz. Anyway, Muppets have been plastered on everything for decades. T-shirts, flat ware, a rather excellent toy line from Palisades Toys, the list goes on. Muppets even made their way into video games. Most of them have been simple, edutainment fare. Things for toddlers to learn shapes or colors or numbers from. After all, Sesame Street has been a pre school staple. But now, and again they’ve ventured out into traditional video games. This week I stumbled onto one of the more interesting, and yet disastrous ones. PROS: Based on one of the best parts of The Muppet Show. CONS: Inconsistent visuals. Poor controls. PSYCHIC GAME: Predicted Gonzo was an alien 16 years before Muppets From Space. 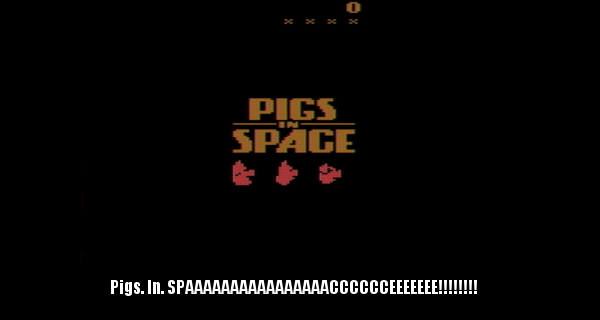 Pigs In Space is loosely based off of one of the Muppet Show’s greatest skits. In it Miss Piggy, Captain Hogthrob, and Dr. Strangepork go on adventures in space that parody popular science fiction. One of their most notable skits, featured Mark Hamill reprising his role as Luke Skywalker, even bringing C-3P0, and R2D2 along. It was pretty funny, and something a lot of kids looked forward to back then. 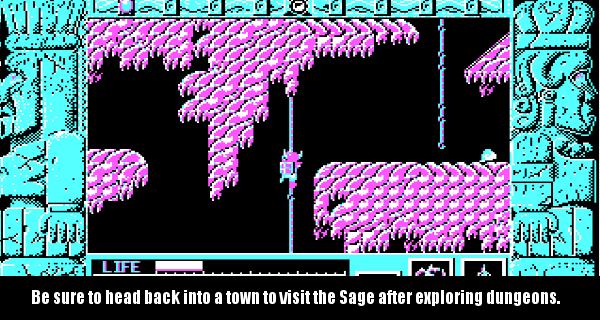 The game however shouldn’t really elicit that sort of nostalgia. Because it isn’t very good. 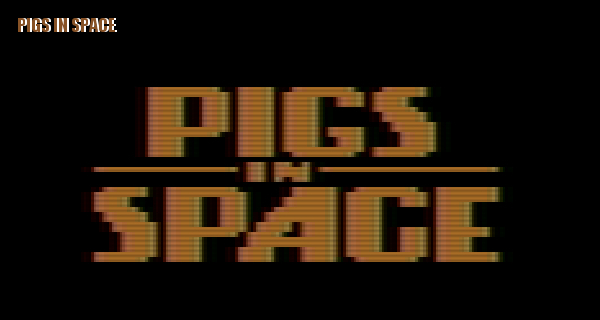 This is probably going to be a fairly short review because there isn’t very much to Pigs In Space. It’s a compilation of three games, two of which are fairly shallow. 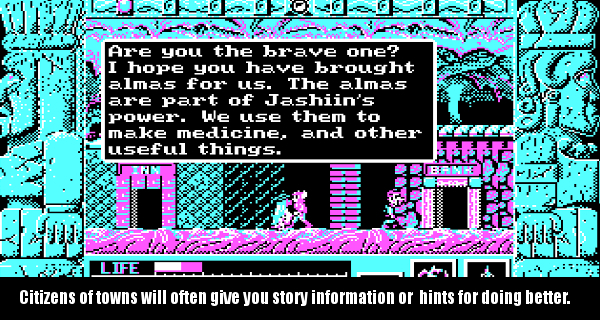 The game starts out with a title screen with none of the design of the skits’ popular moniker. Upon starting the game, you will see three heads appear underneath, and a scoreboard on the top of the screen. Just below the scoreboard are some X’s. These represent the number of lives you have left. Choosing each of the heads will bring you to a corresponding game. The first of these is Captain Hogthrob’s game. It’s the best game on the cartridge, and the only one that could possibly pass for an actual skit. 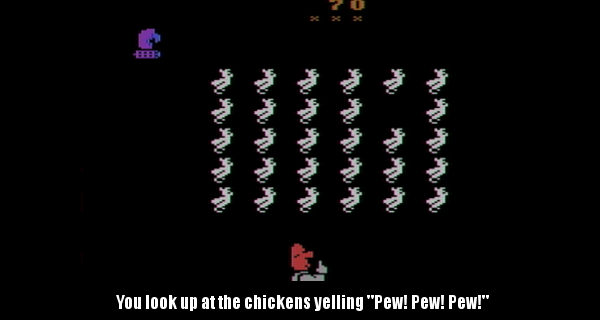 It’s a parody of Space Invaders. The alien ships have all been replaced by Camila the chicken, and the space station that flies across the top has been replaced by a spinning Gonzo head. 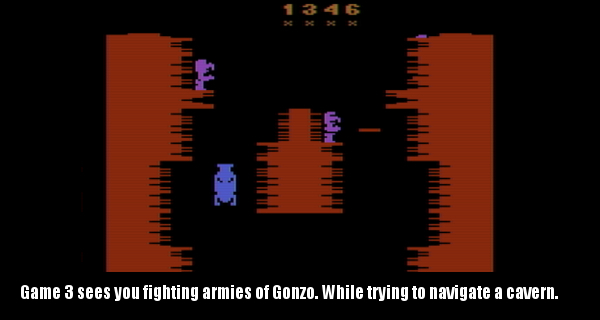 The Gonzo head is interesting, because not a lot of Atari 2600 games were doing the rotation effect this does. In any event, you move the Captain along the bottom eliminating chickens for points. Instead of landing on the ground for victory, they just push you below a certain barrier. The other thing they do is shoot at you the way you would expect. If you get shot, you turn into a chicken, and fly away. The game is the only one that doesn’t end until you lose all of your lives. As a parody of Space Invaders it works, but the clunky movement, and single joke will have you wishing you had just played Space Invaders instead. Next up is Miss Piggy’s game. 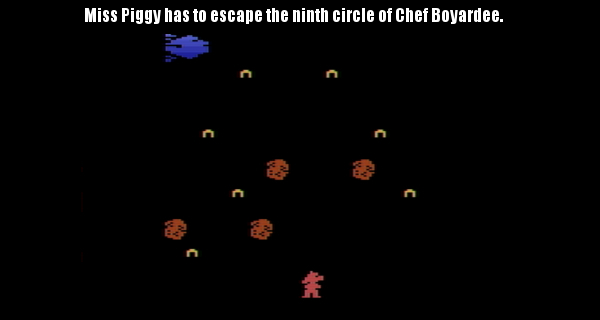 It’s a really bad Frogger clone. If you can even call it a clone. Floating across the screen are spaghetti, and meatballs. Because “Spaghetti Western” I can only guess. The object is to get Miss Piggy across the fast flying food, and into the ship. Once you do that successfully it’s back to the title screen. The faster you do it the bigger the point bonus. Of course if the ship makes it all the way across without you, you’ll lose a life, and have to try again until you’re out of lives. It’s short, you’ll probably play it once, and forget about it. Finally there’s the Dr. Strangepork level. Strange doesn’t really begin to describe it. It’s a vertical shooter. You pilot the Swinetrek through what one can only guess is a cave. Gonzo appears on ledges firing laser guns. If one connects or you touch a wall, you have to start over again. You can shoot at the Gonzos but the game has you do so in the most asinine way possible. It shoots in the direction you last steered. Even more baffling is the arc of the shot is odd. It will go left or right, but also fall back. So landing shots requires pixel perfect timing. With enough practice you can clear the stage. There are no bosses, or tougher enemies on replay. It’s the same thing every time. Clearing the cave again, takes you back to the title screen. There isn’t much else to go over here aside from one crucial point. Points aren’t tied to any one game. Your score carries over between them until you run out of lives. 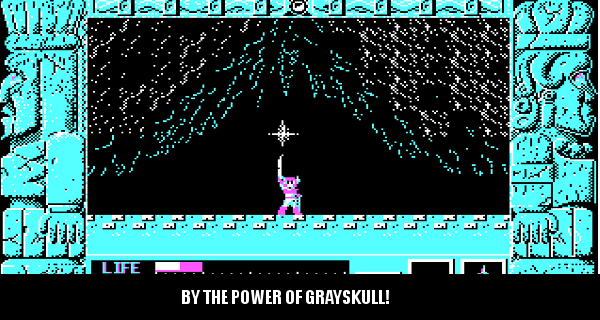 One interesting note about the game is that it is one of the few 2600 games to come out just before the industry crash of 1983. Which makes it one of the rarer games in the library. Although not so rare that you’ll pay a mint for it. It doesn’t have the status of scarcity of other noteworthy 2600 games. 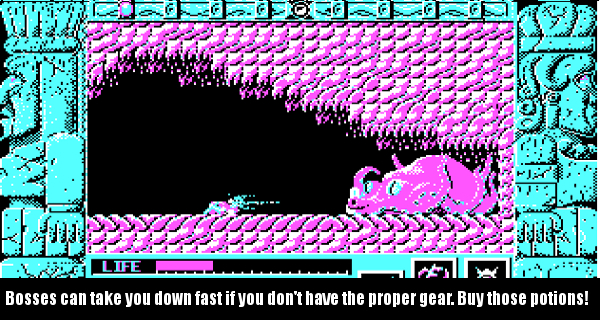 Pigs In Space is a morbid curiosity. Something that you may pick up to say you’ve experienced, or to boast it’s in your collection. Outside of those uses though it isn’t a recommended game. You’ll get a competent Space Invaders knock off, a bad Frogger clone, and a really strange vertical shmup. There are far better 2600 games to play. 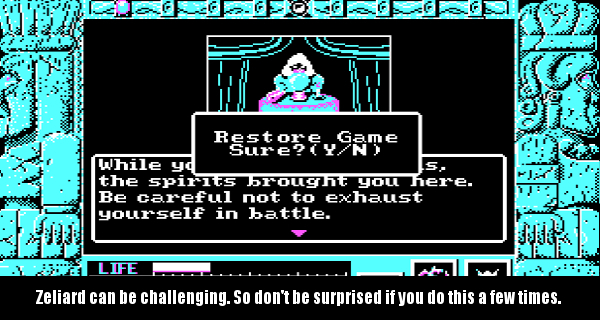 Really, really good 2600 games to play. Get this only if you’re into rarities, and collecting pieces of obscure video game history.